Sitting on a rock high above the Yosemite Valley, I sat in my mother's arms. As we looked across the valley to a towering sea of granite, a deep appreciation was beginning. Since a child, the National Parks were a source of freedom, amazement, and patriotism. Since that day in Yosemite Valley at the age of 2, I’ve been lucky enough to visit a majority of the National Parks. Each visit is a reprieve from daily life, a feeling of excitement and awe. I’ve owned a National Park pass for the last 5 years, and every-time I get to use it is an extraordinary day. This past week I flew to Salt Lake City and met up with my girlfriend Darian. We drove 6 hours to Page, Arizona. The location of the “Horseshoe Bend” a U-shaped formation that the Colorado River carved in Marble Canyon for millions of years. Photos of Horseshoe Bend look like a far off corner of the almost Grand Canyon. Visitors are surprised to see that it is a 15-minute hike from Highway 89. Especially Darian, who like most, had seeing Horseshoe Bend on her bucket list for years. While not a National Park, Horseshoe Bend is located in the Glen Canyon National Recreation Area. So it is regulated, protected, and patrolled by the National Park Service and the Federal Government. Currently, the NPS is working on a brand spanking new parking lot, adding hundreds of spaces to keep up with the ever-expanding amount of visitors Horseshoe Bend sees each day. I had been to Horseshoe Bend before, so when Darian told me she wanted to see it I told her one thing. “It is an unbelievable feat of nature that is extremely beautiful but be prepared for the crowds." 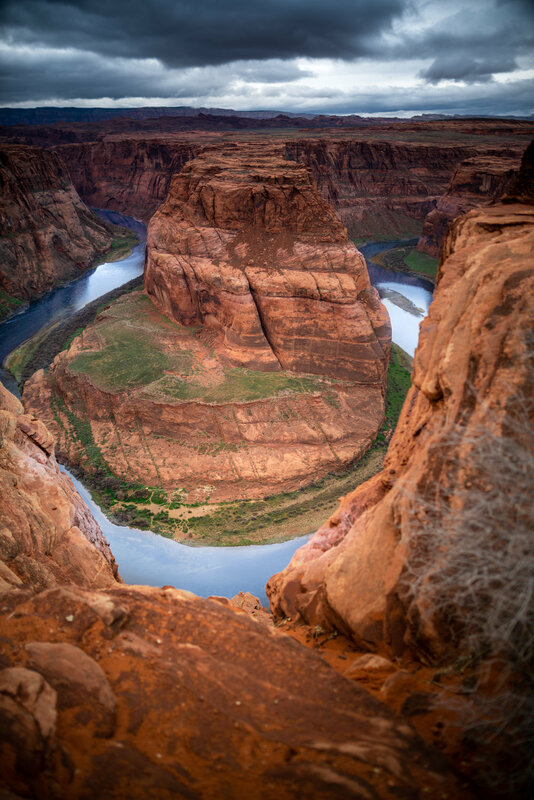 Being a photographer, Horseshoe Bend seems like somewhat of a right of passage. That’s the unfortunate part, it’s overplayed and lacking uniqueness (but prove me wrong). When we arrived at the parking lot we hiked up the small hill and the bend laid before us. I quickly found a cool composition of the bend that I liked and fought off other photographers while I shot a quick time-lapse. While I sat near my camera and looked out to a magnificent view, I also looked around me. I saw hundreds of people, all outside, smiling, photographing, and enjoying the Earth. I quickly stopped my “routine” time-lapse and grabbed my camera and I walked around, not shooting the river but the people around me. I was intrigued when I really paid attention to the sounds they made, the faces and emotions they had. It had finally dawned on me, I had spent so many years of my life traveling to these places. Every-time I fought crowds, scolded people, and complained about how I don’t have a National Park to myself. But I never looked deeper into it, I was ignorant to what was right in front of me, and the real reason that National Parks are so magical. National Parks bring people who otherwise would never be outside. National Parks bring people together for one common reason… an appreciation for the earth we live on. They provide education on earth systems, ecology, and land use. They provide a safe place for millions of Americans to escape. They are America’s best idea, and 103 years later it still proves to be true. At that moment at Horseshoe Bend I decided that I wanted to try something new. I wanted to document the people of the National Parks that I visit. The smiles, the awe, the mystery. I want to see how people use the parks, how they enjoy it. I want to spark a conversation around the protection of these lands, how useful they prove to the human ethos. I want to spark a conversation about leaving no trace, staying on trails, and wildlife in the parks. I want to spark a broader conversation about the overpopulation of the National Parks. How we can create a sustainable and authentic visit for tourists? I would like to preface the series of images below. The photos were taken without permission from anyone involved. The photos are not intended to denigrate, embarrass, or disparage. These photos are intended to tell the story of the National Parks and have no other meaning or intent. Friends take photos of each-other near the edge of the 1,000ft cliff that drops to the Colorado River. One thing that I was overwhelmed with when walking around and taking photos of Horseshoe bend on-goers was the number of people looking at their phones as opposed to the view. It seemed like posting photos of Horseshoe Bend on social media was more important than actually seeing and being at Horseshoe Bend. A group of friends from Boston were visiting the southwest for spring break. This was their first time seeing anything like the western US. I found this exceptionally interesting. This young girl sat on her knees for 10 minutes. She sat silent, looked up and down the canyon. She was one of the only humans there that I didn’t see on a cell phone. I hope she takes something greater away from Horseshoe Bend, and develops a deep application for our wild places. Pets are allowed at Horseshoe Bend, which I found strange. I absolutely love this image. This woman looks so happy, I can imagine she’s sending this selfie to a loved one. It reminds me of Darian’s bucket list, this woman seems like she has waited years to see the Bend. This photo is a great reflection of how much joy our park systems ensue. This is the best photo pose I saw. This man kept getting really close to the edge to scare his girlfriend. I searched #horseshoebend on Instagram to see if I could find this photo. No luck, but it does seem cool. Walking away from Horsehoe Bend that I day I turned to Darian and said “I haven’t had that much fun taking photos in months.” I think it’s important to not take my career so seriously a times. It’s so awesome to do something I would never do normally, even if it was borderline creepy. The next day we went to Zion National Park, I continued the series, and I hope to share the photos soon.